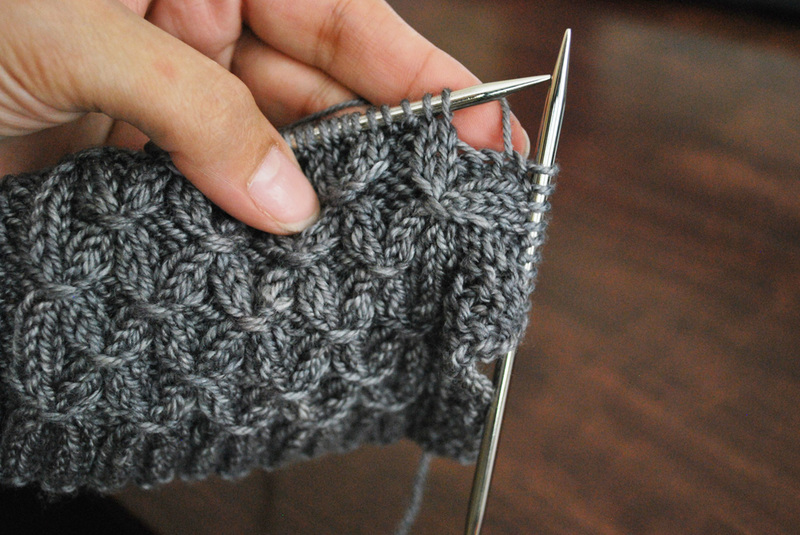 I'm working on a pattern that uses the smocking stitch. I had used smocking once before on a child sized Coraline for my daughter (one that you'd think was knit from barbed wire, the way she reacts to it). I remembered vaguely how to work the stitch, but wasn't 100% sure on the mechanics. I knew that I had to slip stitches to a cable needle, then other stitches were slipped, and somewhere in there I had to wrap the working yarn around. I just couldn't remember the exact order. I googled how to work it, and found that there aren't many places on the Internet with the instructions I wanted. You can just knit your piece in ribbing, and then use a tapestry needle with some yarn to smock the stitches after the fact, but seriously, who wants to add floats to the back of their work when it isn't necessary? I thought I'd add my own and hopefully make it a little easier for those coming behind me. 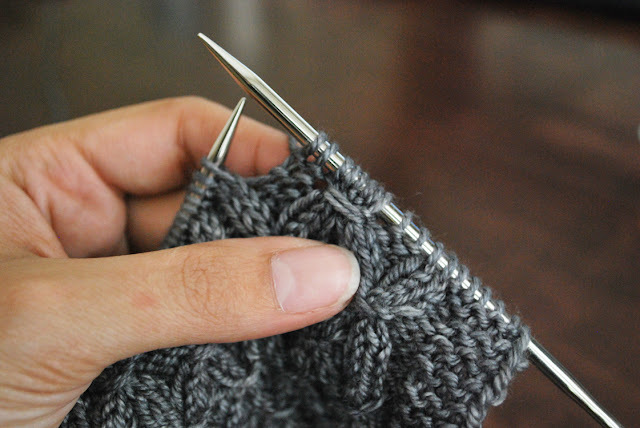 There are variations to the amounts of knits and purls in smocking, but the basic idea is the same. 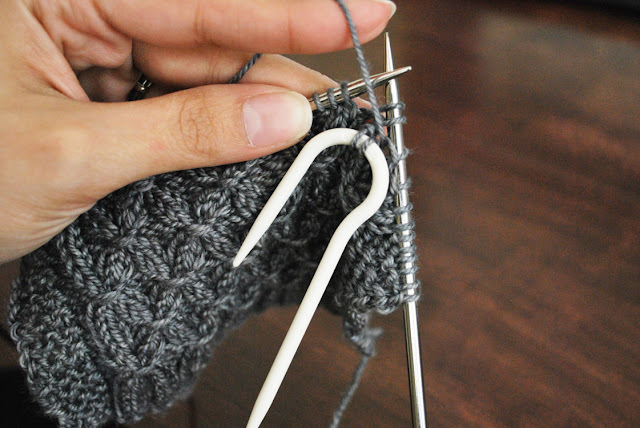 There are knit stitches, purl stitches and more knit stitches. 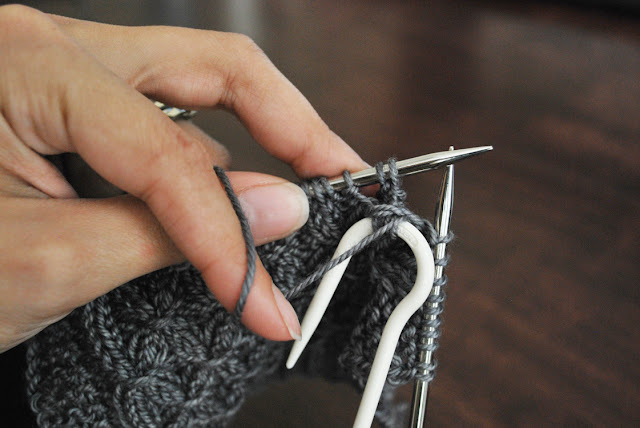 The idea is, you want to wrap the knit stitches together, while leaving the purl stitches in between. 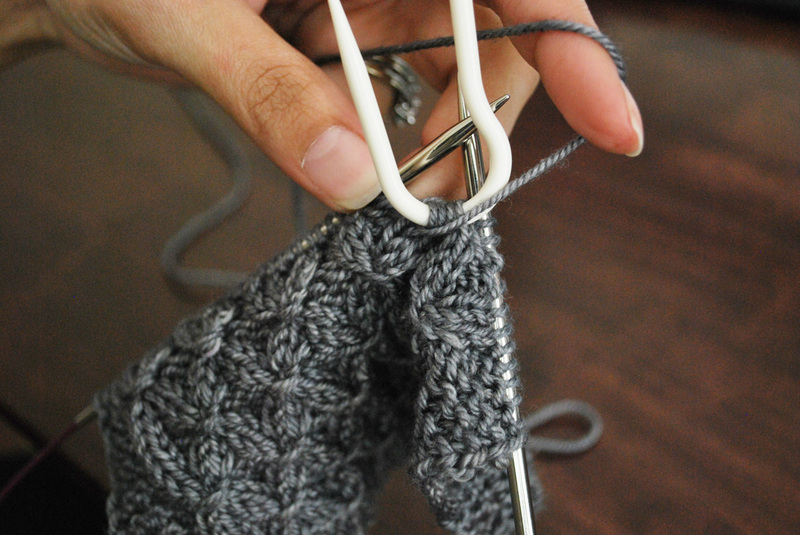 Wrapping the knits together, pulls them closer and creates the smocking in the fabric. The smocking pattern is achieved by smocking together alternating knit columns. 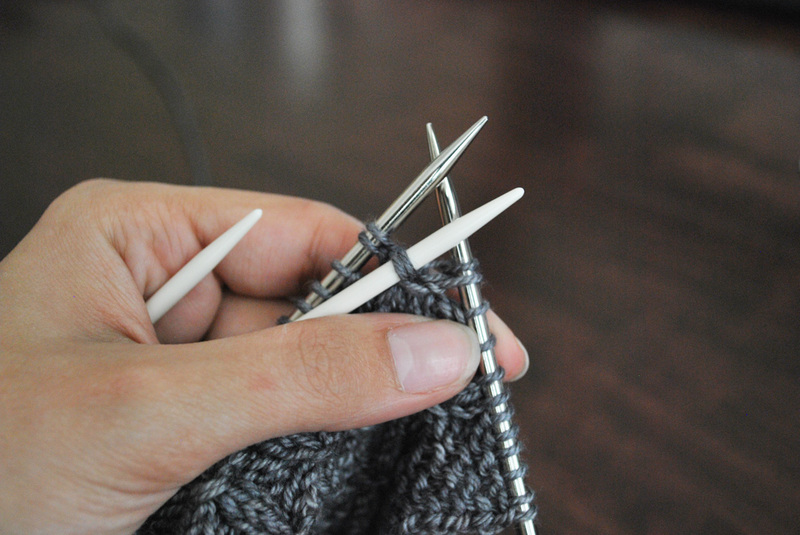 In this case, we have two knit stitches, two purl stitches and then two more knit stitches. We want to smock together the knit columns. Here goes. Please forgive the single handed shots. If I could have kit the camera trigger with my nose to get both hands in the picture, I would have. Sadly, that doesn't work out too well. 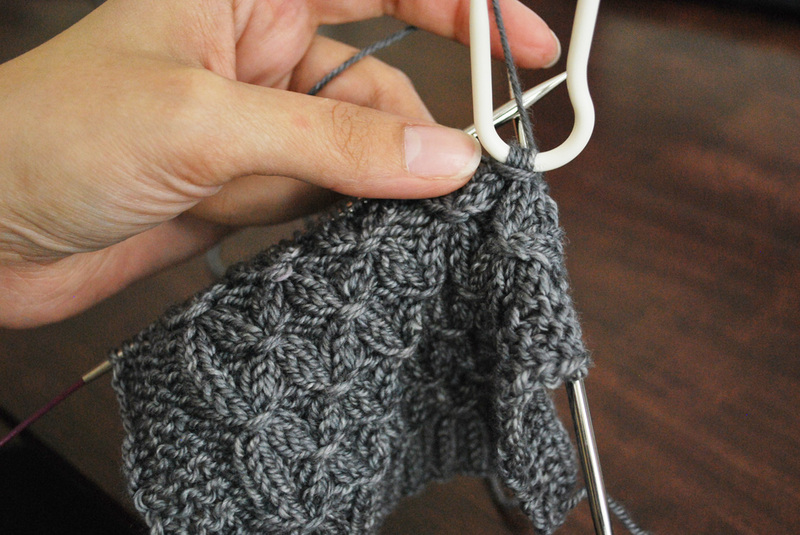 Work your pattern until you arrive at the point where you will need to work the smocking stitches. 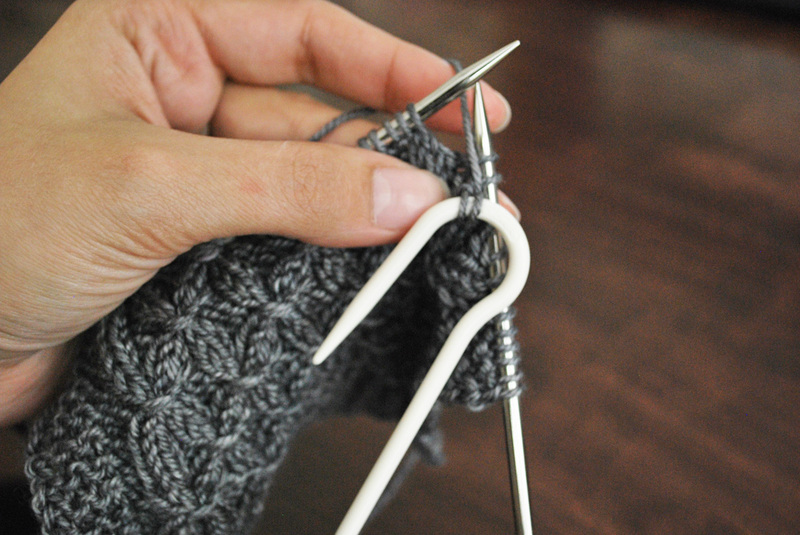 With the yarn in back of work, you will slip your first two stitches onto a cable needle and hold in front of work. 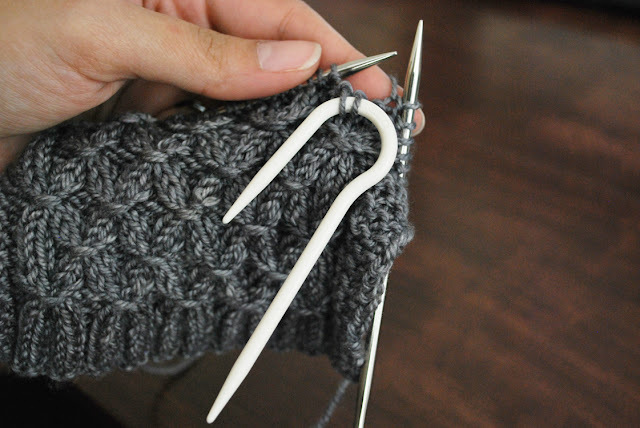 Bring yarn to the front of your work and slip the next two stitches to the right hand needle. Bring your yarn to the back of the work again and slip the next two stitches to the cable needle. 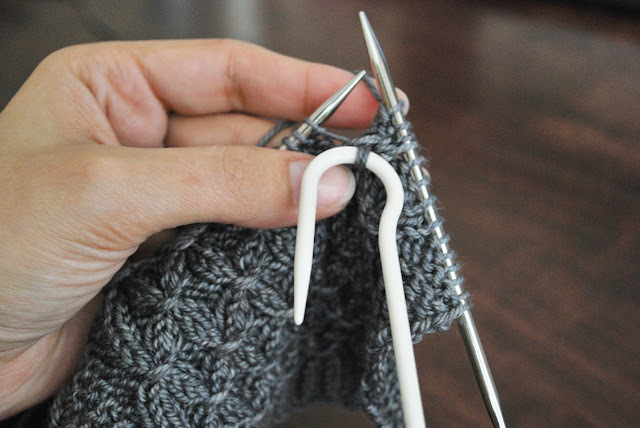 You will now have 4 knit stitches total on the cable needle, and two purl stitches that you slipped to the right hand needle. Now, you will wrap the 4 stitches on the cable needle using the working yarn twice (counter-clockwise). It's a little fiddly, so probably not something you want to do in planes, trains and automobiles. 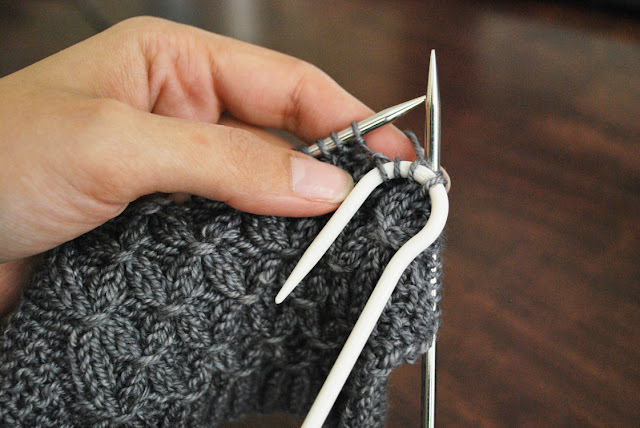 With the yarn held in front of work, slip the two stitches that you previously slipped to the right needle, back to the left needle. 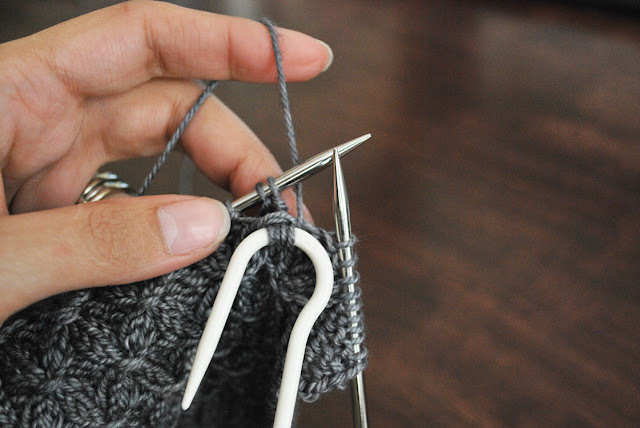 Bring the yarn to the back of the work, ready to work a knit stitch. 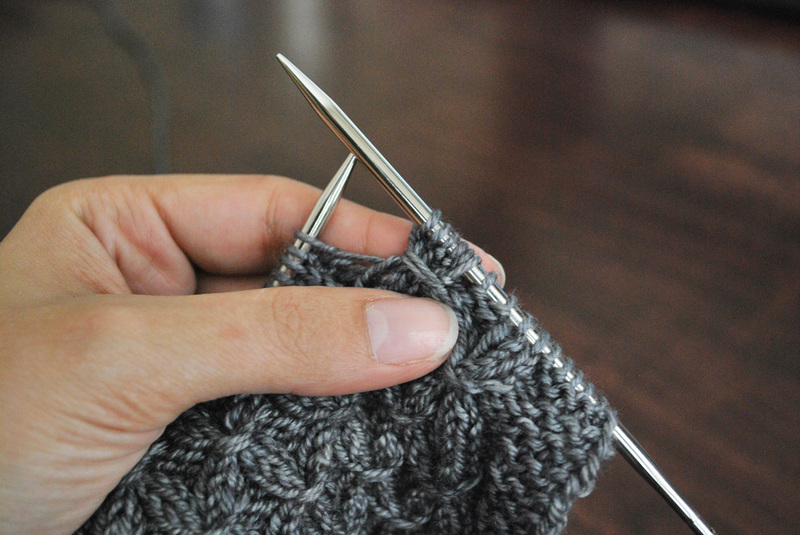 Knit the first two stitches from the cable needle and leave the other two for now. Purl two stitches from the left hand needle. 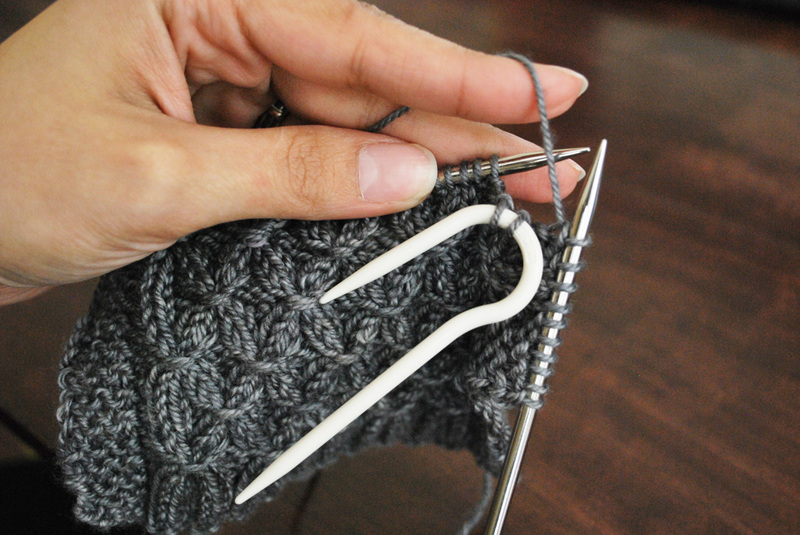 Knit the last two stitches from the cable needle. Now pat yourself on the back for trying something new cause you're awesome! Thanks! 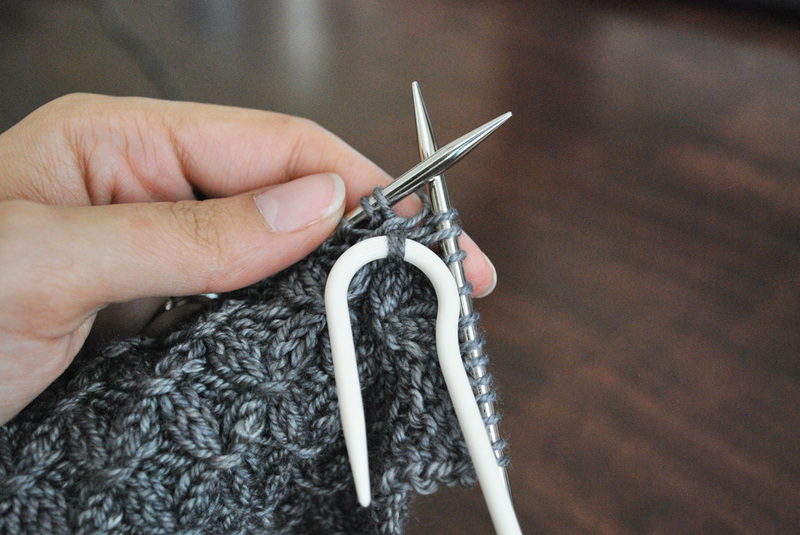 I was looking how to make this stitch. You're lovely!